Home Stanley Lord Lifeboats Don't Lie! FEWER and fewer revisionists of the Titanic disaster are now making the overt claim that the Mystery Ship seen off the port bow at the time of the sinking was (as the American and British Inquiries stated in 1912) the Leyland Liner Californian. But there is still a preference to believe as much, and in a recent case to imply the same - while making sure to offer no direct statement that can be taken to task. A desire to implicate the Californian hinges on one important requirement. 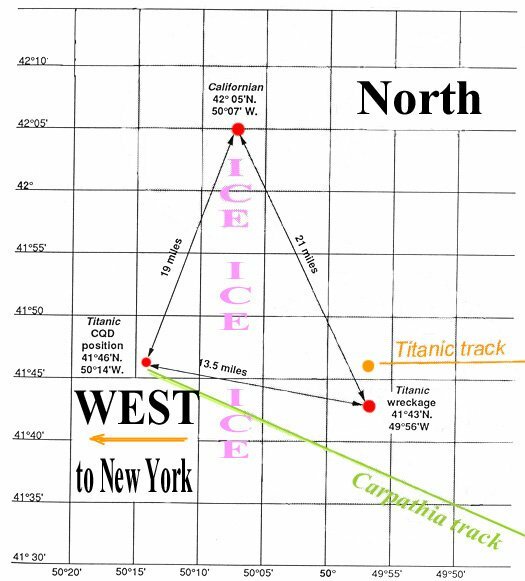 Because the Californian was bound to Boston, to the north of Titanics New York track, and because the Mystery Ship was seen off the Titanics port bow, it is necessary for the White Star liner to be pointing to the north. It should be noted that other points of the compass for the facing of the Titanic would mean that the Californian cannot be the Mystery Ship. She would not be off the port bow in such cases. And while one contributor to the ET message board declares that he chooses to believe that the Californian ended up heading north after her impact with the iceberg, the evidence in support of it is extremely slim. SEE Heading discussed at the bottom of this article. Yet Californian accusers are comfortable with their choice of north. The Titanic faces north. The Mystery Ship is to the north, off the port bow. What do the lifeboats do? They pull for the light. Surely no-one would suggest that the lifeboats rowed away in the opposite direction from the ship lights which offered the prospect of rescue? No, because the testimony is all about the lifeboats pulling for the light. Now consider the fact that the Titanic sank south of her New York track. The track, broadly speaking, was along the latitude line of 41 46 N. But instead the wreck lies at 41 43 N.
Titanic got to 41 43 N, three miles south of track (one minute of latitude equals one nautical mile) after 2.20am. She had been drifting for nearly two hours after the Mystery Ship was first seen. 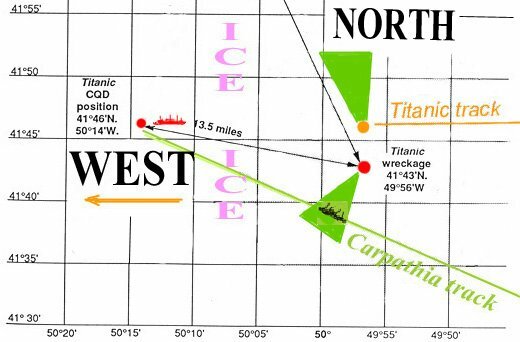 At all material times during the sinking, therefore, the Titanic was between 41 43 N and 41 46 N.
We should not expect to find lifeboats BELOW the southern boundary of 41 43 N, because they all put off before she sank, when Titanic was north of that line. And when they were lowered, they pulled further to the north again, because some 21st Century interpreters would tell us thats where the light of the Mystery Ship lay. If the lifeboats pursue the Mystery Ship to the north, then they are naturally going north of the line 41 46 N, which in essence represents the New York track. There is another significance to the line 41 46 N.
It is the latitude of the SOS position, where the Titanic claimed to be sinking. This invaluable assistance will come into play later. But first let us consider the case of Lifeboat 8, which was either the first or second boat launched on the port side. She left at 1am, according to Alfred Crawford, the crewman in charge. Captain Smith told the occupants (and Crawford, Caroline Bonnell, Countess of Rothes, Ella White, Thomas Jones all recalled the instructions) to pull for the light, land the passengers, and return to the Titanic. They attempted to do so, such that when they heard the cries of the drowning they were (Br. 18058) I should say a mile and a half from the Titanic. That was the evidence of bedroom steward Crawford. He thought the Mystery Ship was between 5 and 7 miles away (in his US evidence he emphasised not more than ten, but gave the other estimate widely). If the Mystery Ship is 5-7 miles away to the north, and if she is the stationary Californian (which did not move until 6am, long after dawn), then Crawford has reduced the gap between her and his lifeboat to 3½ - 5½ miles by 2.20am. Br. 18052. You have not told us what distance you rowed in the direction of these lights? Crawford  I should say between 3 and 4 miles, by the time the morning came. The morning came at or after 4am. Three hours of pulling should have reduced the gap between Lifeboat 8 and the Mystery Ship to the north by three or four miles. Subtracted from 5-7 miles (original estimate) leaves the gap now at 2-3 miles. The estimates of drift given at the Inquiries all centre of one half-mile per hour (half a knot). 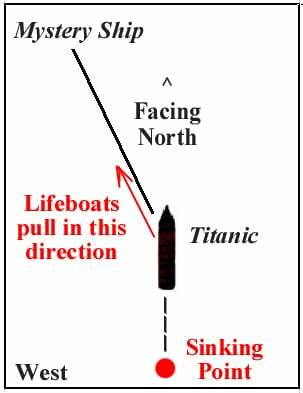 The declination of the Titanic wreck from the New York track suggests it was more, but let us allow half a knot. In three hours therefore (from 1am to 4am), the Californian will have "come to meet" the lifeboats through drift by 1½ miles from her previous position. Crawford and his lead lifeboat, instead of being 2-3 miles away, should now be as close as half a mile (to 1½ miles) from the Mystery Ship - if she is the Californian. She should present an unmistakable sight. But instead they cant see their ship any more, the Carpathia arrives behind them, and they turn about and make for her instead. Even though she is three or four miles away. Crawfords boat made little over one a mile per hour. 'Three or four miles' from 1am to 4am. Thats pretty slow. A fit person can run a mile in five or six minutes. Crawfords boat takes ten times longer to row the same distance. Yet he says (also Br. 18052)  We were furthest away from the Carpathia. Very naturally. They launched early, close to the port bow where the Mystery Ship was seen, and had the Captains orders to reach it. They relied on these orders to assuage any guilt at the cries they heard, and instead rowed harder away  towards the light. Even a snails pace, 1mph over three hours (one-third of Merseys best estimate) takes Lifeboat 8 three miles to the north. That will put her in a latitude of 41 49 N.
Coming back would mean returning south, since we are accepting that the Mystery Ship was to the north. But before Crawford and his crew take a single oar-stroke to the south, we can see that they are in a minimum northerly latitude of 41 49 N at 4am. We know lifeboat 8 rowed to the Carpathias side. If the three or four miles estimate which Crawford says (at Br. 18052) his boat pulled to the north is the same as the three or four miles away that he estimates Carpathia appeared in the opposite direction, then it is common sense to imagine that the Carpathia is practically at the point of departure for lifeboat 8. Three or four, minus an equivalent amount, is zero. Carpathia should be where boat 8 launched, on the New York track (41 46 N) - not where the Titanic sank (41 43 N), but a few miles further north again. Even if boat 8 is at the minimum position of 41 49 N (one mile an hour in pursuit of the Mystery Ship) the Carpathia is at 41 46 N or 41 45 N, three or four miles away. That would mean the Carpathia had steamed north of the actual sinking site by a couple of miles. Yet she saw only one body when picking up the lifeboats. Clearly the Carpathia did not go north of the wreck site, or even up to the wreck site. This was vastly off her course, which was plotted to the SOS position. Nobody can today say that the Carpathia took any course from that to which her Captain testified. Rostron is a disinterested source of information. But he came across the lifeboats  and much earlier than he expected. I knew we were a long way off and it seemed so high, that Rostron thought it might be a light at the masthead of a still-afloat Titanic. Br. 25394.  At twenty minutes to three I saw the green flare, which is the White Star Companys night signal, and naturally, knowing I must be at least 20 miles away, I thought it was the ship herself still. Here the Carpathia is represented by a blue dot, with lifeboat 2 by a green dot. 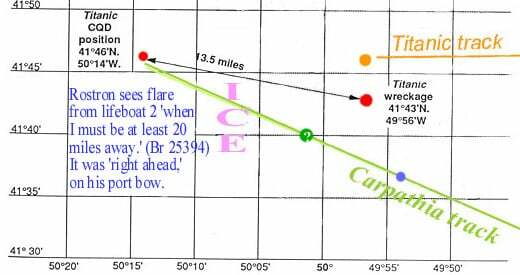 There is only a small question mark over how far away the lifeboat was when its flare was seen, but the important point to grasp is that it was directly on the Carpathias course. Br 25401.  At twenty minutes to three I saw a night signal, as I was saying, and it was just about half a point on the port bow, practically right ahead. This establishes that the lifeboat was on the course line (the flare actually seen slightly south of it, being on the port bow)  in other words that the lifeboat had gone to the south. Nor could the Carpathia could not have come across those lifeboats so quickly (or at all) if those lifeboats had gone to the north  where we are told by self-appointed experts that the Mystery Ship lay. There is yet another proof of this contention. Captain Moore of the Mount Temple said his vessel reached the Titanic's [SOS] position shortly after daylight. Moore was thus on the line of 41 46 N, albeit much further to the west. He had two lookouts in the crows nest. They may not have seen lifeboats (had they been there) across the icefield, but in daylight the Mount Temple ought to have been able to see the Carpathia, had she also been on the line of 41 46 N, or anywhere near it. Even if the hull was obscured by some mightily towering iceberg, the SMOKE column of the Carpathia would have been unmistakable. They would have known if a ship had been there. The Carpathia had also been firing rockets in response to Officer Boxhalls green flares in lifeboat 2. But Moore saw nothing whatever where he was. He said he had seen no rockets or flares at all in the darkness before his arrival  ruling out Carpathia as having been in the close vicinity - and now there was nothing to see in daylight. Moore verified that he was indeed at the SOS position through observations. It led him to believe, correctly, that the Titanic had sunk at least eight miles to the east. It was impassable where he was. So Mount Temple went south. Carpathia was to the south of the 41 46 line, and to the south of the 41 43 line. We can see what her course line was, even if she diverted from it to pick up lifeboats here and there. But she came across lifeboats on her course in the first place  which shows the lifeboats went to the south, not to the north. Yet the lifeboats, the lead ones, pulled towards the Mystery Ship! This diagram illustrates the position, with the Mount Temple emblem in red and the Carpathia on her indisputable course line to the SOS position  in which she intercepted lifeboats. The green cones are unscientific, but are indicated fields of where the lifeboats might have been encountered if they had gone to the north in pursuit of a Mystery Ship (top) and where they were actually found, south of both the impact site and the wreck site (bottom). and then she steamed south for a further half an hour before cutting straight across the icefield to the Carpathia. 7399. Then at 6.30 you steered a southerly course and passed the Mount Temple stopped at about 7.30? Captain Lord  Yes. 7401. After 7.30 had you to navigate through the field ice again?  Yes, I ran along till I got to the Carpathia bearing north-east and then I cut straight through the ice at full speed. 7402. We were running till it must have been about eight. 7018. Did you eventually get to the position of the foundering of the Titanic? Captain Lord: The real position or the position given? how about whistleblower Charles V. Groves of the Californian? 8345. How far off was [the Mount Temple] do you think?  Well, when I noticed her firstI had been paying particular attention to this other steamer  I should think she would be perhaps a mile and a half away from us. 8346. Nearer than the Carpathia?  Much nearer than the Carpathia. Running down the west side of the ice field for an extra half hour after passing the Mount Temple at the SOS position, the Californian at 13 knots (the Chief Engineer said 13½) made 6.5 miles to the south. Look at the map. Even with an extra half-mile taken away (to leave Carpathia bearing north-east), the latitude line of arrival is 41 40 N. (41 46 minus 6 miles/minutes equals 41 40 N). That is EXACTLY along the Carpathias interception line. And Carpathias course is known! We should also be aware of the critical fact that at 5am, an hour after the Carpathia was seen by lifeboat 8, Rostron's vessel could not see the Californian. It is at this time that Rostron says he could see two steamers (Mount Temple and her 'foreign-looking' tramp) and the Carpathia's Captain specifically says: "Neither was the Californian." Br 25551. [Rostron} - "It was daylight at about 4.20 a.m. At 5 o'clock it was light enough to see all round the horizon. We then saw two steamships to the northwards, perhaps seven or eight miles distant. Neither of them was the Californian." The Californian does not move until 6am. She can't be seen at 5am, even seven or eight miles away. This on its own establishes that the Mystery Ship was not the Californian, because she can't disappear without using her engines. But the Mystery Ship did at last present her stern light and pass from view! The Attorney-General: It [Crawfords evidence] helps us to fix the position; we cannot do more than that at present. We can follow what he means having followed out where the Carpathia was to some extent. We make her a little to the southeast [of the SOS position]. The Commissioner: South and east. 18090. (The Attorney-General.) Yes, almost exactly southeast; but we will work it out later, and your Lordship will see from the evidence of the Captain of the Carpathia it will be made clear. That is calculating it according to the evidence already given in America. He did not give his position, but he did give a position at one time, and said how many miles he steamed after it, and from that we work out she would have been to the southeast. The lifeboats were picked up by the Carpathia south of the wreck site. They went south after leaving the Titanic (regardless of how far west they may have gone). They did not go north. But they pulled for the Mystery Ship. Therefore the Mystery Ship was not to the north. Therefore the Mystery Ship was not the Californian! The change of heading from < (westward, as the Titanic had been driving), to a heading ^ or north, represents a fairly violent turn. We know there was a violent turn to avoid the berg, but to port, not to starboard. This left the Titanic pointing momentarily south of west, with the berg impacting on the starboard bow. Br. 1000.  The vessel veered off two points, she went to the southward of west. It is likely the Titanic came back on her course (< west) after impact. Two engine room survivors, Thomas Dillon and Frederick Scott gave evidence that after the vessel had initially stopped, she got underway again. Br. 13757. When you came out. on deck was the ship already stopped or slowing down through the water?  She was proceeding slowly, a matter of perhaps six knots or something like that. Passenger Lawrence Beesley, wrote in his 1912 book that the stopping of the ship had caused him to investigate. The course resumption, more widely described than in these extracts, naturally destroys the claim that it was the act of avoiding the iceberg that left the Titanic facing north. That theory, widely claimed in poorly researched publications, is simply invalid. Once the course is resumed, the natural supposition is that one would literally resume the western course on the New York track. Californian critics naturally cannot have this, as it puts the Titanic bows facing west. When she finally stops, therefore, the Mystery Ship will be seen off the port bow. The Mystery Ship then cannot be the Californian, because the Californian is to the north. It thus becomes necessary to construct an unexplained trek by the Titanic to the north  leaving the comfort and traffic of the New York track behind her in order to enter a shipping No Mans Land where no vessels might be expected until the Boston track is reached. The sheer unlikelihood of such a journey is no obstacle, because it simply must be that the Californian is the Titanics Mystery Ship. That is the desired outcome. Yet the further north one desires the Titanic to go, the further she must ultimately retreat. Because the wreck site is known, and is found three miles to the south of the New York track! When drift from impact to sinking is taken out, the Titanic is back on her original track, which, of course, was taking her west. If she journeyed to the north of the New York track, we should expect to find the wreck to the north of latitude line 41 46 N. Instead she lies at 41 43 N.
Those who would continue to have the Californian as the Mystery Ship must get the Titanics head to the north. If she cant journey there, then current and drift must swing her bows in that direction. Mere drift however, even if it takes the Titanics bows to the north, cannot bring the Californian any closer if she is north of the line 42 N, as she repeatedly reported in pre-impact wireless transmissions. And if the Titanic stays on the New York track  as indicated by her wreck site  then the Californian is totally out of visual range, no matter how the Titanic is pointing her bows. Of course, the actual location of the Californian is a movable feast for those determined to convict. She can be dragged as far south as necessary to bring her into visual range  even though she has been stopped since 10.21pm AST, and telegraphed this fact to the Titanic before the latter struck her berg. Californian engine room log books confirm the vessel was idle from that time. But this awkward fact is naturally ignored. Hauling the Californian to the south is one thing. Yet she must remain somewhat to the north of Titanic in order to be seen off the Titanic port bow as the Mystery Ship unquestionably was. What is the evidence as to how Titanic was pointing when the Mystery Ship was seen? Only one ranking crew member says her head finished north. He is the sole basis in evidence that the Titanic bows were in this direction. 17667. When you saw this light did you notice whether the head of the Titanic was altering either to port or starboard?  Yes. 17668. You did notice?  Yes. 17669. Was your vessels head swinging at the time you saw this light of this other vessel?  I put it down that her stern was swinging. 17670. Which way was her stern swinging?  Practically dead south, I believe, then. 17671. Do you mean her head was facing south?  No, her head was facing north. She was coming round to starboard. That is just one account. It is contradicted by others, including that of two Titanic officers. Senator Fletcher: Apparently that (mystery) ship came within 4 or 5 miles of the Titanic, and then turned and went away; in what direction, westward or southward? Senator Fletcher: In a westerly direction; almost the direction in which she had come? - Yes, sir. Sen. Fletcher: Was she a little toward your port bow? Sen. Fletcher: And apparently coming toward you?  Yes. These quotes, taken together, indicate the Titanic was pointing westward < when the Mystery Ship was seen. And Boxhall had been on watch immediately before the impact. He knew the course and heading, and knew where the compass was. Pitman: I saw one white light. Senator Smith: Where?  Away on the horizon. We could not make anything out of it. At what time? About half past one. While you were lying on your oars in the lifeboat?  Yes. In what position was it? Smith: Right on the course of the Titanic? Smith: Did you hear the testimony of Mr. Boxhall on that point? Pitman: No, I did not. I have heard him speak about it. Californian accusers must rely on Quartermaster Rowe, to the exclusion of all others. 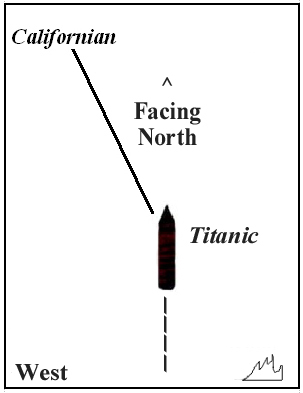 We can see how the various theories as to the north-facing of the Titanic are extremely exclusionary. But Californian critics, in a different century, are comfortable with their choice. Is there not here the gravest danger of sheer wish-fulfilment? Even with that choice of north, however, the lifeboat trajectories and Carpathia's actual course demolish the last remaining option.